***PLEASE “ MESSAGE” MANAGER/OWNER ANNETTE FIRST----BEFORE SENDING A BOOKING REQUEST!! ( JUST CLICK ON " ASK MANAGER A QUESTION" & SEND ) **** **This bright & sunny, adorable,colorful home is filled with Vineyard charm! **** Great location!! 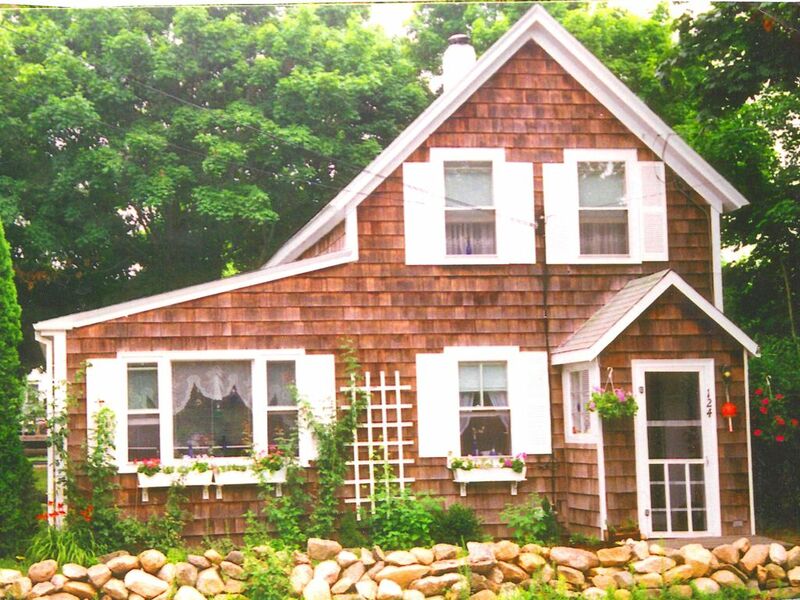 Convenient IN-TOWN Oak Bluffs location - WALK TO EVERYTHING !!! : BEACHES, Flying Horses, Arcade, Movie Theater, ferry, harbor/marina, shops, art galleries, restaurants, outdoor bars,bike path, playgrounds, public library, ponds, walking trails, gingerbread cottages, parks, tennis, basketball courts , baseball field, golf, groceries. **INCLUDES: HI-SPEED WIRELESS INTERNET, 3 new flat-screen TVs with CABLE / ON-DEMAND /built in Netflix/ free Showtime/ free Streampix --there are 3 new X1 boxes with voice remotes, BEACH CHAIRS , COOLERS, BEACH UMBRELLA, BOOGIE BOARDS** Relax in the hammock. Features include hardwood floors, open living/dining room with BRAND NEW SOFAS ( one is a queen sleeper). There is a full bathroom with shower and bath on the 1st floor and there is also a private hot water outdoor shower as well.The large enclosed outside hot water shower has tea lights for evening showers, Large back deck w/ furniture (built-in bench seating, 2 tables with lots of chairs, two cushioned loungers, gas grill.). White tea lights for evenings relaxing and entertaining on the deck. Inside, you'll love the eat-in country kitchen. Ideal home for people who like to be near everything.Partially fenced-in yard (back and both sides fenced), Off-street parking in two new large driveways.Tony's Market & a BBQ restaurant are just steps away. Three bedrooms ( 2 queens, 3 twins ( one is a rollaway bed that can go in any room), sleeps 8, large outdoor shower & back deck with tea lights** ALL NEW PLUSH MATTRESSES/BEDS!! *** ( 2 queens , 2 twins and queen sleep sofa are brand new !) , 3 flat screen TVs ( with Netflix, Youtube,Pandora, Crackle, Huluplus) with CABLE / ON-DEMAND/built in Netflix/ free Showtime/ free Streampix --there are 3 new X1 boxes with voice remotes and 2 DVD players, Ipod & Iphone dock , MP3 connection, stereo, radio, 2 CD players. Just a short walk to the gingerbread cottages and gardens , where you can attend a summer concert ,or be there for historical Illumination Night or the fabulous annual fireworks. Meet friends at the harbor for cocktails & great food at one of the many restaurants & shops. The kids will love the game room, candy shop, fudge shop, Flying Horses Carousel, ice-cream shops, Ocean Park and the movie theaters.WASHER & DRYER! Located just 7 miles off the Massachusetts coastline, the beautiful island of Martha’s Vineyard is a world apart, offering a vacation ambiance unlike any other. Explore the diversity of six island towns, take long walks along o pristine shores, and step back in time to a more leisurely pace. Each season offers something different. Come and experience all the island of Martha’s Vineyard has to offer. Oak Bluffs operates the largest marina on Martha's Vineyard, which not only has the most slips, but is situated in the midst of the historic gingerbread campgrounds, and offers easy access to the rest of the Island. I have been renting homes on VRBO and Homeaway since 2008. IN TOWN-- you can walk to everything!!! There is a FULL bathroom with a shower and bath on the1st floor and there is ALSO a private hot water outdoor shower as well. The large outdoor hot-water shower has white tea lights for evening showers!. Walk to harbor, shops,restaurants, EVERYTHING!! Fully equipped kitchen.Plenty of dishes and glassware in fun colors.Also a lobster pot and untensils. Great home close to everything in OB! Great home in a great location in OB! Close to everything - we brought our car over to the island but anytime we did anything in OB we were able to walk! We picked this home due to it's location and it allowed us to bring our dog - the yard was perfect (with a lead!) for her to hang out with us. There is a bbq restaurant around the corner and Tony's market across the street. Wonderful place to stay! We have been coming to the Vineyard for 10 summers now and this was our favorite summer yet! ! We had two adults and three kids with us. The house fit us very comfortably with some room to spare! The yard was perfect for some lawn games and relaxing on the deck after a day at the beach. Quick walk to town and beaches. The outdoor shower was the best! I cannot say enough good things about this place! It was perfect!!! So cute and cozy for our family vacation. We were so happy staying here for our family vacation. On arrival we were just blown away by how beautiful the yard and the deck were. The whole house was just adorable. So clean and cozy. We couldn't believe the convenience of the store across the street also. And the Bar-b-que restaurant also across the street. It took a 10 minute walk to the water and everything that Martha's Vineyard has to offer. Definitely want to go back next year!!!! House was adorable and in a great location. The house was cute, colorful, and convenient. The market across the street had everything we could need. Owner was pleasant and had great communication. Being able to bring our little dog made it a perfect family vacation. The house was super cute and clean. Slept the 6 of us very comfortably. The backyard and grill was great for hosting a BBQ. Walking distance to the town. There is a fabulous deli across the street that had all the essentials. Looking forward to the stay next summer! We’ve stayed at Annette’s home a few times now and have enjoyed it every time! The location is the best- right in oaks bluff, near some walking trails and you can walk into town. There’s also a great deli across the street for lunch and breakfast sandwiches. The backyard is nice with lots of seating, grill and hammock/patio set. Nice outdoor shower too. Great that it’s dog friendly! Annette is very responsive on questions as well or anything you need during your stay. We hope we get to stay here again in the future! Beaches, harbor, water sports, hiking, biking, roller blading, walking trails, clay cliffs, gingerbread houses, bike paths, tennis, basketball, baseball, playgrounds, golf,shopping, restaurants, art galleries, ponds, fishing, farms. *CLOSE TO FARM NECK GOLF COURSE!! ***PLEASE “ MESSAGE” MANAGER/OWNER ANNETTE FIRST----BEFORE SENDING A BOOKING REQUEST!! ( JUST CLICK ON " ASK MANAGER A QUESTION" & SEND ) Refundable security deposit $250 DOGS WELCOME!